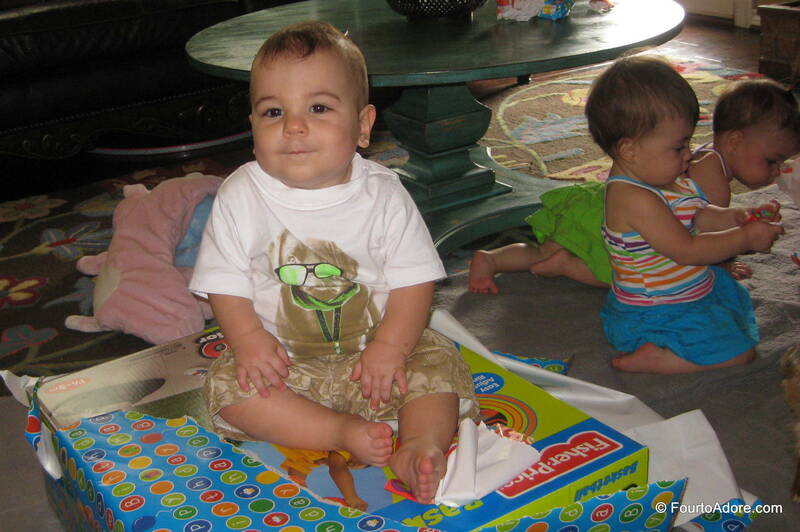 Way back when the babies were tiny three pounders in the NICU, people often shook their head as they remarked, “Oh just wait until they walk…” Back in those days, we had bigger fish to fry than to worry about toddlers. 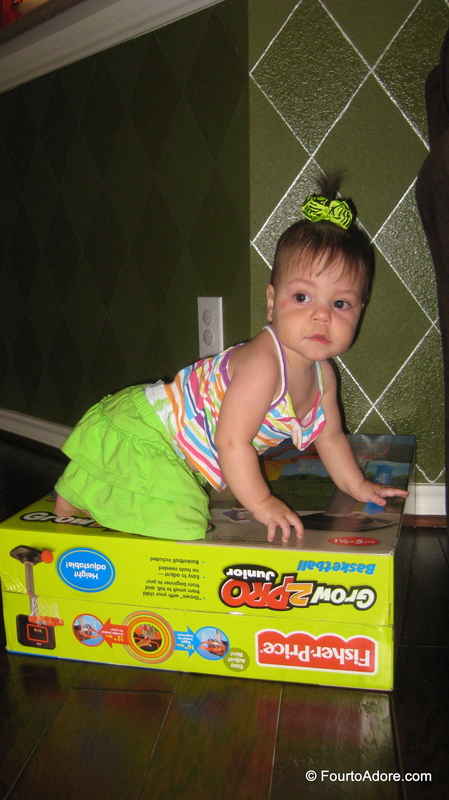 Once the babies became proficient crawlers, baby proofing became a necessity and we figured they couldn’t become much more challenging. I mean, a crawling baby knows no boundaries. How much worse could it be? Immediately after tearing into this birthday gift, Harper climbed on top as if staking claim. This is perhaps Harper’s favorite “new trick”. I’ve been working very hard to teach him how to get down safely and for the most part he’s doing well. I was in the kitchen approximately 30 seconds and found this upon my return. He was notably stuck. 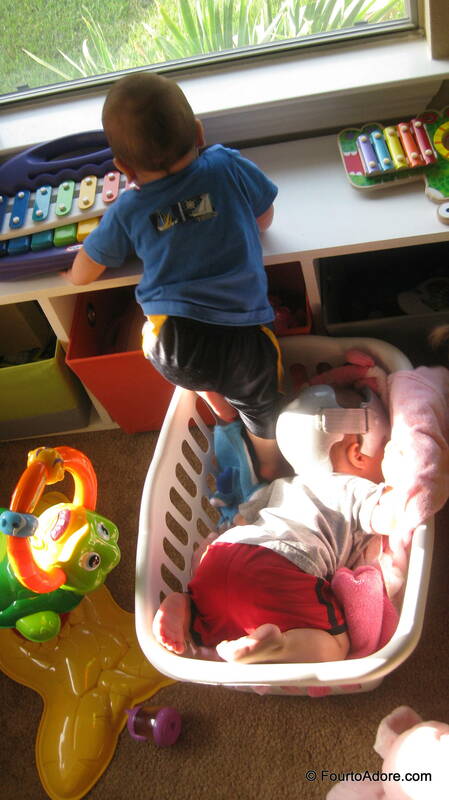 Harper slithered into this laundry basket and Mason was just behind him. 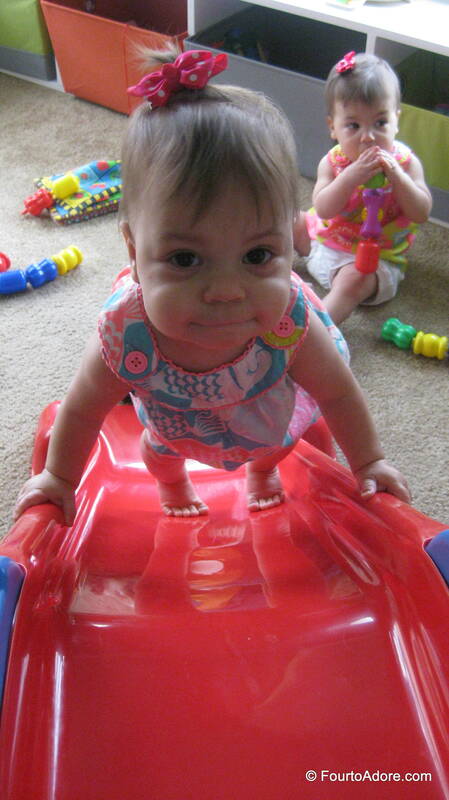 The babies may not be able to manage the slide ladder, but that doesn’t stop them from reaching the top. You might suspect that only the boys are expert climbers, but the girls are just as wiry and curious. Little Miss Sydney perched right on this box without blinking. 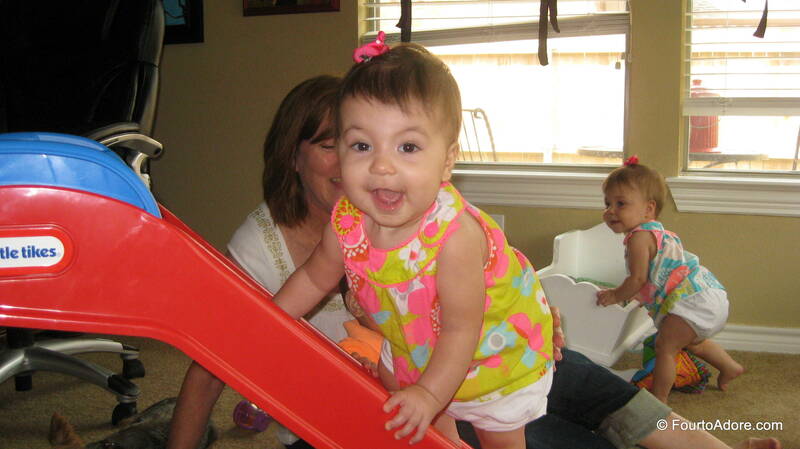 Rylin is pleased as punch shimmying up the slide. Oh yes, Sydney can do it too! In fact, she’s the most adept at slide climbing. Not much you can do but keep the little ice packs handy. Maybe less toys in their play area at a time. Bolt the kitchen set to the wall. They are awesome kids. Just enjoy they and love them when they get hurt. 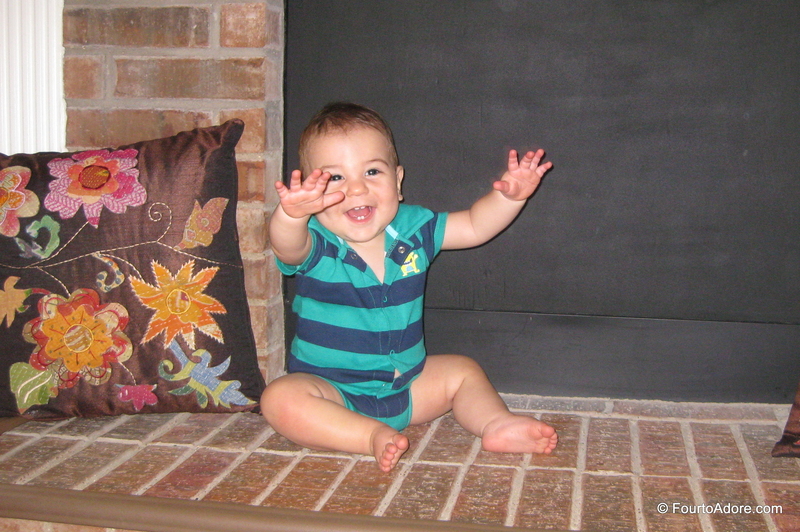 My best baby proofing tip is a schedule!! Just because babies can move all over the place doesn’t mean they should be allowed! Yes they need free time to explore, but they also need structured times in a pack and play, on the blanket, seated in chairs looking at books! Until they can be trusted to not get in to things they should not, I believe in limiting the amount of time they’re free to just be mobile!! Totally agree!!! Our schedule is our savior. Amber, ours are monkeys too! Tyler especially, I have been calling him our Evel Kinevel lately becase of his insatiable appetite for exploring the vertical world and testing out gravity. Good thing he’s apparently made of rubber! 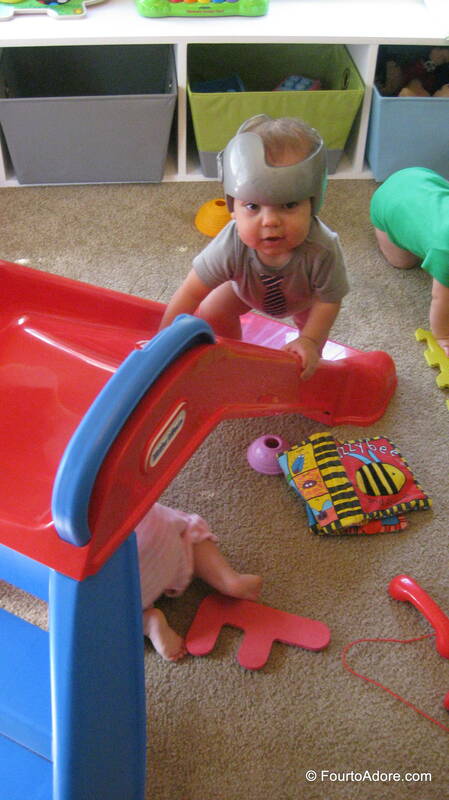 Haha Mason is our evil kaneival and he has that nice little crash helmet. Thank God for our play room – pretty much everything in there is baby proofed and we just put part of the corral around the two rocking recliners since Logan and Kailey love to get in them now. Kailey truly loves laying in them and looks adorable and relaxed, I hated to block her from them. She even knows how to get down! But am worried another baby will rock the dickens out of the chair and send her flying onto her head. Other than that, it’s just toy injuries and occasionally biting their lip or cheeks with their teeth by accident since they aren’t used to having so many chompers. I do have two pocket doors that close off my kitchen, so sometimes I let them out of the play room and they can roam the kitchen and breakfast area while I cook/prep/clean. 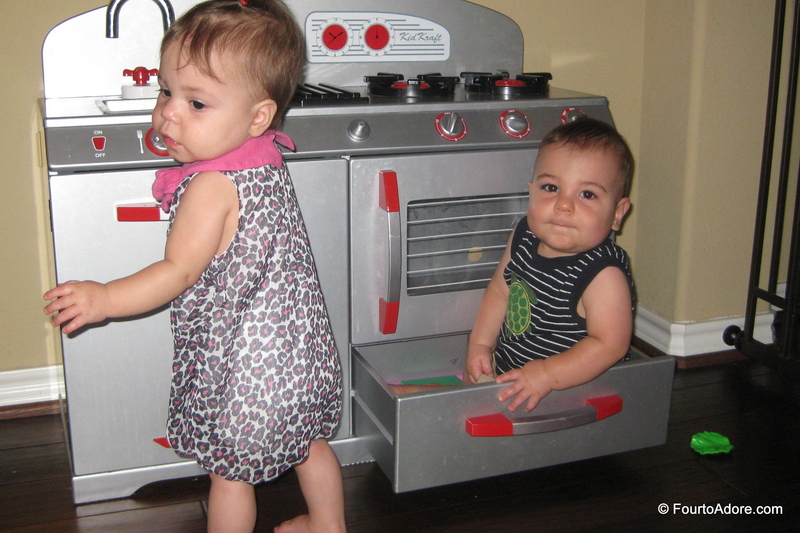 But I still have some more baby proofing to do in that arena, mostly installing more baby locks on the bottom cabinets! A baby proof playroom is heavenly! Our sort of play room doubles as a study so I have to really keep tabs on the littles. I can imagine the dangers of a recliner with toddlers, oh my! The climbing is the scariest thing to me with that age because they don’t know how to get down safely. Be sure to anchor any bookcases/dressers/shelves to the wall. We ended up taking books and dvds off of the lower shelves and just storing them away in closets because it was a constant battle trying to keep them from taking them off the shelves. I’d much rather have my house look a little more like toddlers live in it than have to constantly reprimand my kiddos (esp. at that age between 1 and 2 when understanding consequences is still a tough concept to grasp for them). For awhile when ours were first mobile we kept them pretty confined to one room, but you’ll soon see that these big kids get very restless in the same space all day and will drive you crazy if you don’t let them explore a little bit. If you make the environment safe then you don’t have to worry about giving them a little more freedom to roam. The climbing is what scares me, for the same reason. We change rooms about every 30 minutes and being in new places makes a huge difference in behavior/ compliance.